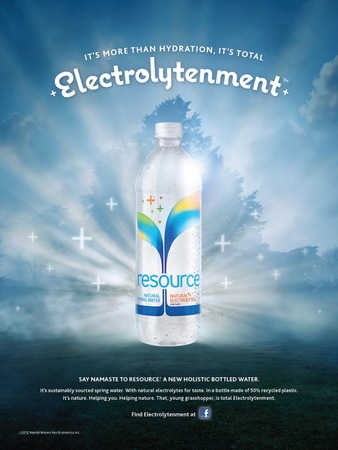 It’s more than hydration, it’s total Electrolytenment’ announced Nestlé to launch Resource, a new 100% natural spring water in the USA earlier this month. The water was presented along with The Fountain of Electrolytenment—an interactive installation concept developed by McCann Erickson. The fountain functioned from May 3 to 6 at The Grove in Los Angeles. Open for public, it attracted 30,000 visitors and answered over 17,000 questions. Due to augmented reality technology, people could ask any questions in voice and get answers in real time on a scripted ‘sheet’ of water. Sometimes the answers were really smart and unexpected, watch the videos below. The campaign is also supported by print, outdoor, digital advertising and social media. The fountain idea reminds of Coca-Cola’s project in Ecuador last year, when the company launched a 3D fountain that also interacted with audience. The new Nestlé’s spring water contains naturally-occurring electrolytes for better taste and quality and is sourced in a sustainable way. The bottle is made of 50% recycled plastic. The product is positioned as a ‘holistic’ water and targets intellegent and health-concious audience. ‘Say namaste to Resource,’ suggests the company.